Following the world debut of the all-new 2011 Audi A8, many of us were waiting to hear if a S8 would be in the cards. Rumors now are swirling that not only will Audi continue to offer an A8 W12 but also the S-car flagship, Audi S8 will be offered. 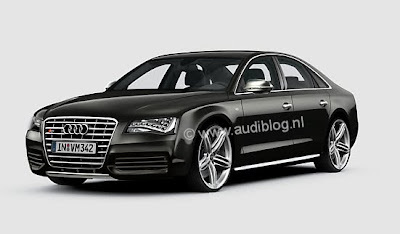 Audiblog.nl took the liberty of creating what they think the new S8 will look like (pictured above). Car and Driver contributor, Jens Meiners has commented in his recent blog post that Audi will offer an A8 W12 boasting a rise in horsepower from 450hp to 500hp. In addition to the A8 W12, Meiners also notes; "For enthusiast drivers, an S8 version will definitely follow, but details are still sketchy." As Meiners comments that the S8's details are sketchy, rumor is that the 2011 S8 will boast a variation of the RS6's twin-turbo V10. In addition, Meiners also notes (as did Rupert Stadler at the A8's premier) that Audi will create an A8 hybrid.